Come experience quality eye care at our Elko Optometry. Welcome to the Patient Center for Total Eyecare in Elko, NV! Welcome to the Patient Center for Total Eyecare in Elko. Besides having a wealth of experience, Total Eyecare team strive to provide the finest in optometry services. Along with offering routine eye exams, our optometrist in Elko also helps our patients combat certain eye diseases and teach them the importance of maintaining optimum eye health. At Total Eyecare, our optometrist provides high-quality vision care with a personal touch in a professional and friendly environment. We have high standards when it comes to caring for the vision of our patients and we are always striving to improve our profession. We welcome the opportunity to serve you and do our best to meet all of your vision care needs. We invite you to browse our website to learn more about our optometrist in Elko, NV. If you or anyone in your family is in need of an eye exam or any other type of optometry services, contact our Elko eye doctor today at (775) 738-8491 to schedule your appointment. If you are a new patient, feel free to check out our new patient center. "Your office is always very friendly yet professional and very pleasant experience. Always organized with customer service in mind. Thank you." 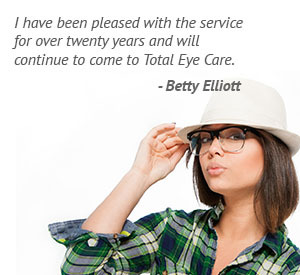 "I have been pleased with the service for over twenty years and will continue to come to Total Eye Care"